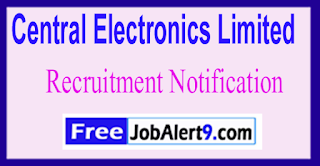 CEL (Central Electronics Limited) Has Released Recruitment Notification For 05 Assistant Technical Manager Posts. All Eligible And Interested Candidates Can Apply Online On Or Before 30-06-2017 (30th June 2017). 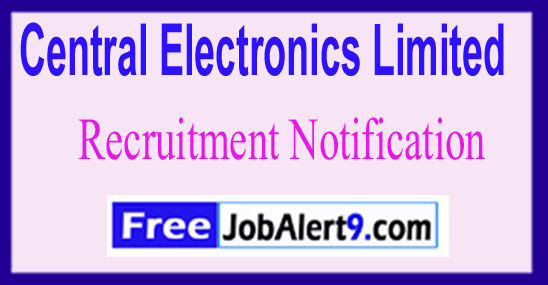 Further Detailed Information Regarding Educational Qualifications, Age Limit, Selection Procedure, Exam Pattern, Syllabus for CEL (Central Electronics Limited) Recruitment 2017 - 05 Assistant Technical Manager Post is mentioned below. Candidates upper age limit should not Exceed 35 Years As on 31-05-2017. Candidates should have done Engineering Degree (B.E/B.Tech degree in Electrical or Electronics orMechanical Engineering) / its equivalent qualification from A recognized university. Rs. 20,600 - 46,500/- . All Eligible & Interested candidate fill the on-line application through official web-site (http://www.celindia.co.in) before / (30th June 2017). Last Date To Submit Online Application - 30-06-2017. Click Here For CEL Recruitment 2017, Advertisement.